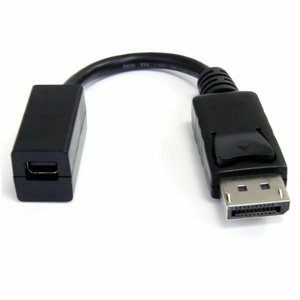 The DP2MDPMF6IN DisplayPort® to Mini DisplayPort Adapter turns a mini DisplayPort (male) connector into a regular DisplayPort (male) connector. The DisplayPort® to Mini DisplayPort Adapter makes it easy to connect a mini DisplayPort-equipped monitor to a laptop that only provides a standard DisplayPort output (e.g. Apple®, Toshiba® etc.). Utilizes nickel connector plating to ensure guaranteed reliability.